With so many comic books being adapted into some of the most popular movies and television shows in Hollywood right now, you might find yourself wanting to go back to their roots on the page. But reading through the world’s most celebrated graphic novels isn’t so simple. There are so many different genres, publishers, and styles to choose from, making it overwhelming to find a proper starting point. 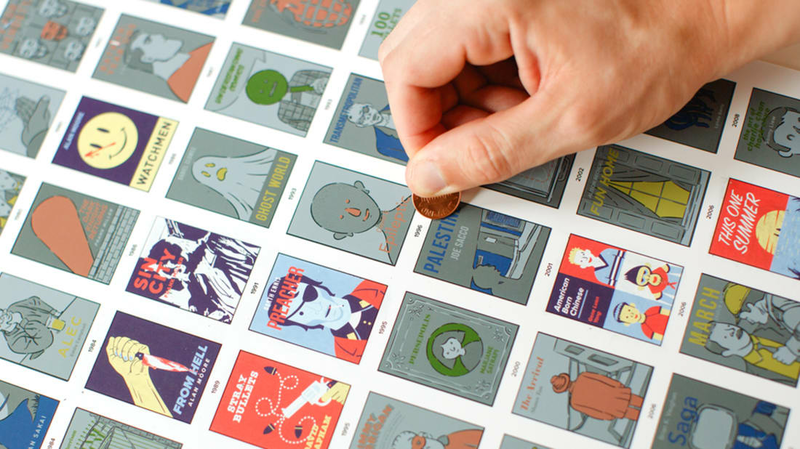 This new scratch-off poster from the folks at Pop Chart Lab solves that problem by turning that daunting reading list into a colorful piece of home decor. 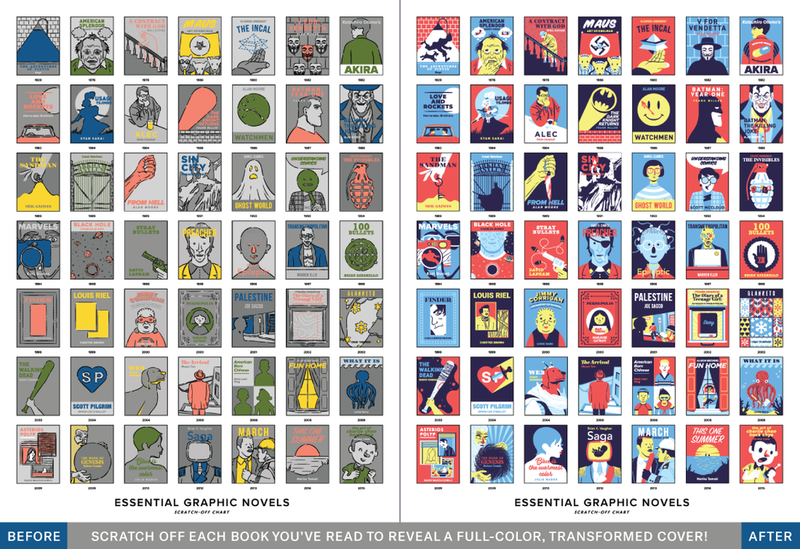 The chart features illustrated icons from dozens of different graphic novels from all around the world. Though you’ll recognize familiar sights like the bat signal from Frank Miller’s The Dark Knight Returns and Spider Jerusalem from Transmetropolitan, they’ll be colored in a drab grey. Once you gently scratch off that monochrome outer layer, though, you’ll reveal a vibrant new image underneath. The idea is to scratch off each title as you read through the list to turn the chart into colorful wall art that shows off your progress. And don’t worry, there’s no filler on this chart. Standards like Watchmen, Maus, and A Contract With God share space with recent hits, including the Civil Rights Movement title March, the spellbinding sci-fi world of Saga, and the coming-of-age tale This One Summer. It’s also perfect for fans looking to expand beyond superhero titles, as you’ll only find a handful of men in tights here, with the highlights being Marvels, Batman: Year One, and Batman: The Killing Joke. The rest is made up of samurai epics (Usagi Yojimbo), fantasy classics (Sandman), memoirs (Fun Home), and crime comics (Stray Bullets). The chart is 12 inches by 16 inches and costs $25 over on the Pop Chart Lab website. Once you pre-order, the pieces will start shipping on August 21. 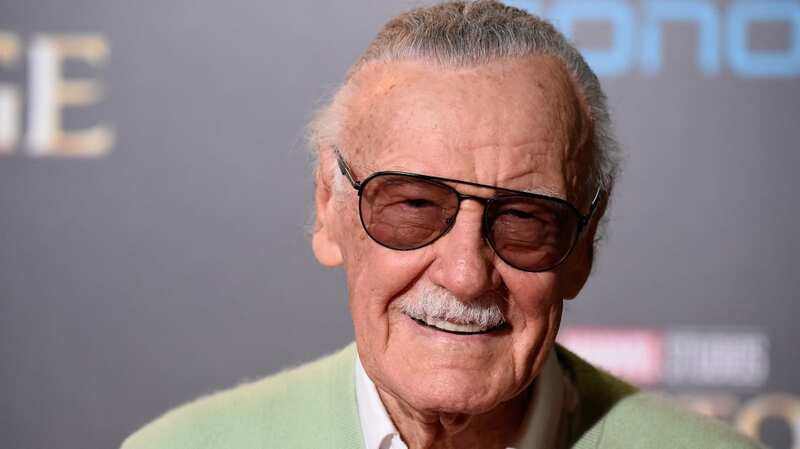 When Stan Lee died on November 12, 2018 at age 95, he left a hole in the world of superheroes that he helped create. He also left behind a few surprises: In addition to his posthumous cameos in Captain Marvel and Avengers: Endgame this year, the comic book writer contributed to a class on superheroes that's now available on edX. The SmithsonianX course, titled "The Rise of Superheroes and Their Impact on Pop Culture," traces the history of the genre from the Golden Age of comic books to the Marvel Cinematic Universe. Before his death, Stan Lee helped shape the curriculum as a virtual instructor. He's joined by instructors Michael Uslan, executive producer of The Dark Knight series; David Uslan, a comic book publisher and Michael's son; and Christopher Robichaud, a professor who writes about superheroes and philosophy. While learning about the history of superheroes, students will get a lesson on American history at the same time: The class covers Word War II, the McCarthy Era, and globalization through a comic book-tinted lens. You can enroll in the six-week course for free through edX, or pay $50 to pursue a verified certificate. Here are some more online courses you can sign up for in 2019. 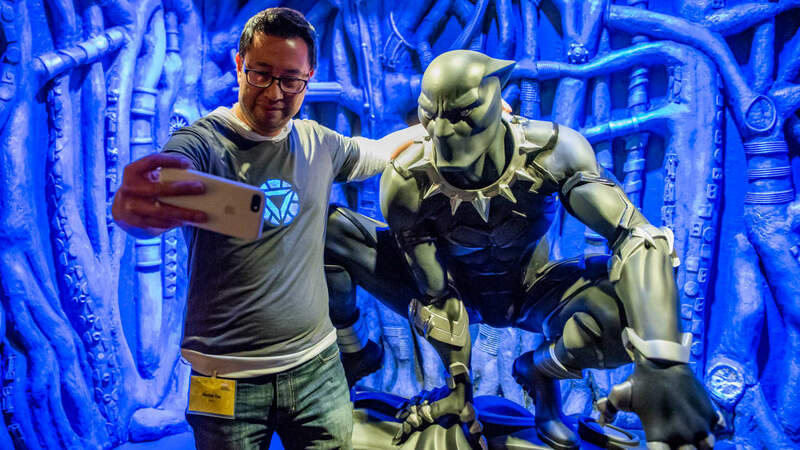 If you’ve come down with a case of Marvel mania, there’s a museum in Philadelphia where you can sate your appetite for superhero lore, rare comic book art, movie props, trivia, and more. As the PhillyVoice reports, an exhibit called “Marvel: Universe of Super Heroes” is open now through September 2 at The Franklin Institute. It’s a fitting time to launch the exhibit, since Marvel is celebrating its 80th anniversary this year. The exhibit begins with items from Marvel’s early days in the 1930s, when the company was known as Timely Comics. Marvel’s universe grew and grew over the decades, and now encompasses more than 8000 characters. In total, the exhibit features more than 300 original artifacts, including many of the movie-quality costumes that were worn by the actors of Black Panther (Chadwick Boseman and Danai Gurira), Thor (Chris Hemsworth), Spider-Man (Tom Holland), and Captain America (Chris Evans). There are also original artworks, including two covers of The Avengers comic books and the original drawings of Spider-Man’s origin story. “This global-spanning fantasy franchise that is in everybody's brains begins with an individual working at a drawing board with a pencil and paper—that's where world-conquering stories begin,” exhibit curator Ben Saunders told the PhillyVoice. “That's what I wanted to tell over and over and over again in this show." Check out some photos of the exhibit below, and visit The Franklin Institute’s website for more details and tickets.